Basalt running back Jake Reardon carries the ball against Delta on Friday, Oct. 12, 2018 in Basalt. (Photo by Austin Colbert/The Aspen Times). Jake Reardon only cares about winning, not so much his individual stats. Regardless of what the Basalt High School senior running back is looking at, he should be pretty pleased. Behind Reardon’s unofficial 193 yards rushing and two touchdowns, the Longhorns came away with a crucial 13-0 win over visiting Delta on Friday in Basalt to remain undefeated on the season. The win improves Basalt, ranked No. 6 in Class 2A this week, to 7-0 on the season and 3-0 in 2A Western Slope League play. BHS entered the contest with the No. 1 RPI in the classification. No. 10 Delta dropped to 4-3 and 1-2. 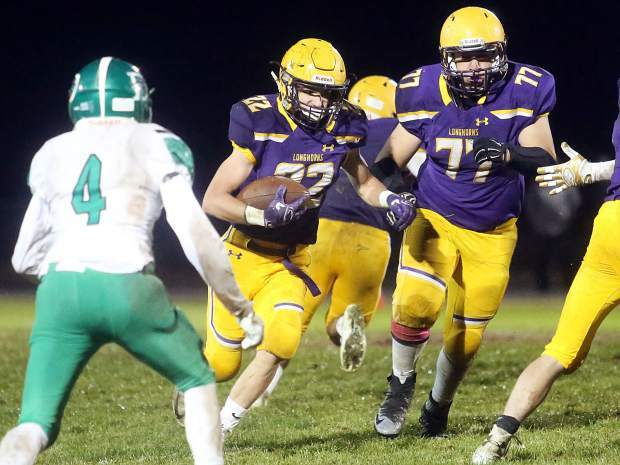 The Panthers likely needed to beat Basalt to stay in the playoff picture. This was the fifth shutout in seven games for the Longhorns, who have only allowed 13 points all season. Basalt led 6-0 after a quarter thanks to a 41-yard Reardon touchdown run. The lead was 13-0 at halftime after Reardon scored again, this time from 25 yards out, with 3:58 to play until the break. The second half was a defensive grind, which is just fine for a Longhorn defense that barely bends, much less breaks. Basalt heads on the road next week with a game at Rifle (6-1, 2-1). The Bears, who were ranked No. 3 in the state this week, were stunned, 20-19, by unranked Aspen on Friday, in Rifle. This means Basalt has the outright WSL lead with two games remaining, while Aspen and Rifle are tied for second with a league loss each.